So, here I am a week on from my last post. Still a bit gloopy in the brain department, but coming together again. 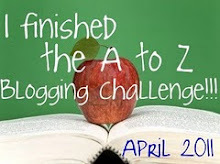 Prior to the A-Z challenge (thankyou Arlee at Tossing it Out and faithful crew) I had few followers (and don't we all wish that that word was more welcoming and friendly), and we kind of knew each other and accepted various foibles regarding such arbitrary things as schedules. I'll try to settle into a pattern however, mostly posting on Sunday and include some photos possibly from my travels both here, Victoria, Australia and overseas and have a bit of a chat about them. Given my passion for kids and adults with learning difficulties, my love of the environment and general concern that the underdogs in this world don't get much of a fair go, those interests will probably sneak in too from time to time. But the serious wordy stuff will still be over at traverselife, so don't worry, I'll try to keep it light and whimsical here! 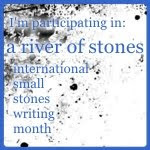 I might also write some 'small stones' later in the year - after all that's why I started this blog. I suspect for the next couple of weeks photos will be most dominant - I'm a bit worded out. My mother used to say "Stop eating when you've had elegant sufficiency". Right now I feel like I've been a complete glutton with words and I'm paying for it with severe indigestion! For all the lovely new people who've dropped in during the challenge and decided to stay around for a while "Hello" it's lovely to have you here, and if it doesn't work out between us, and you wander off after a while, I fully understand. Life happens, we get busy, that's just the way it is, but it's been a wonderful supportive and encouraging month, and for that I'm incredibly grateful. For everyone who commented, thanks, it'd be great to hear more from you when you have time. I do try to repay visits, but sometimes I trip up, so I'll apologise in advance if I don't manage that goal. Right now, I'm going to wander off and find some photos for tomorrow. Stella, the 8 week old Guide Dog puppy. Being trained by a friend. OOwwee, that puppy is so sweet. They are so adorable and floppy. Now comes the big question, what do we write about when we don't have a letter and a theme? I think I'll write in drabbles. I learned that word from you and Rosalind. See you later. I seriously know what you mean about gloopy brain. I can't imagine having done two blogs for the entire month. Wow is all I have to say about that. I do use a schedule, but my brain doesn't like chaos. It functions better with order so I have a tentative schedule just to help me focus or else I get all flustered. Manzanita, Stella is soooooo cute! I'm looking forward to seeing your Drabbles, I'll give them a break for a while I think, but it's always great to see how other people manage them. I'll bumble around for a while and see what happens - I'm sure something will crop up. Dafeenah, flustered is no fun, and I appreciate what you're saying. With your very full life, a schedule makes sense. I hope all is well with you and the power is a bit more reliable. I'm still on my break, just cruising with no regard to what is next. My themes on this blog are always writing but that tends to collect other stuff too - like my Buddhist practice and its influence on my writing, or dealing with a family while trying to stick to my schedule, like that. My other blog - Living the Complicated Simple Life - is more for things like knitting, gardening, chickens and randomness! Jan, so good to hear! I still get caught up in "shoulds". 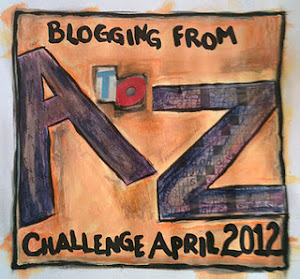 I'm easing my way back in gradually, and looking forward to meandering through your blogs. Tara, I get the feeling a lot of us that don't quite manage structured schedules, and I fully understand the reading thing too - life happens to us!